Maurice B. Graham was appointed to the University of Missouri Board of Curators in 2015 by Gov. Jay Nixon. Graham is president of the law firm of Gray, Ritter & Graham, P.C. and is a past president of the Missouri Bar, the St. Louis Bar Foundation, and the University of Missouri Law School Foundation. He has served as a member and chairman of the Supreme Court Advisory Committee, which oversees attorney discipline in Missouri. He is a Fellow of the American College of Trial Lawyers, the International Society of Barristers, the International Academy of Trial Lawyers, the Missouri Association of Trial Attorneys, the American Association for Justice, and the American Trial Lawyers Association. Graham attended Central Methodist University and obtained both his bachelor’s degree and juris doctorate from the University of Missouri. He has received distinguished alumni awards from both universities, and is a past member of the Board of Curators of Central Methodist University as well as a trustee of the philanthropic Jefferson Club at the University of Missouri. 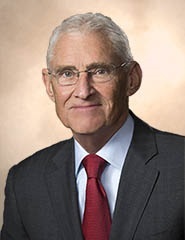 He was chairman of the University of Missouri Law School’s $17 million endowment campaign. Graham is also a member and a past chairman of the Sheldon Arts Foundation Board in St. Louis.